It's long overdue, but a story published in The Wellingtonian says that Wellington City Council and Wellington Waterfront Ltd are building a number of new, albeit temporary, motor-home sites, including one at Kumutoto Wharf. 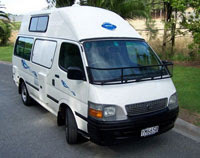 It's largely in preparation for the 2011 Rugby World Cup, although Wellington Tourism spokesperson David Perks told media that it's essential for Wellington to have motorhome sites in the city. Perks says there is a lack of sites close to the CBD, which means international visitors "don't get to experience staying in Wellington to the full potential." The main problem is that it's very expensive to secure land. However, Kumutoto Wharf appears to be suitable and construction is under way to develop a site that can accommodate 39 campers. That's only until developers need the land, which means the hunt for suitable sites continues.